Okay, so sometimes the skies aren't as blue as the pictures we use on our web sites. And, yes, sometimes it rains. So here's some suggestions for things to do when the weather isn't perfect. Try it! You won't melt. Clachaig has a large drying room, and all of our self catering properties have a dryer and good heated space in which to dry clothes and boots. After all these years of living and working here, we can tell you that planning activities by the weather forecast just isn't sensible. In the borrowed words of a popular advertising slogan, just do it. You'll be surprised just how often it turns out to be the best day of your trip. 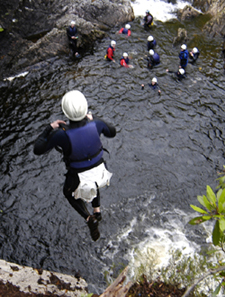 Try canyoning at Vertical Descents in Onich. There's no point playing in rivers if there's no water in them! Wet suits are provided. Many of our short walks are good for a bit of fresh air before beating a retreat to a conveniently located cafe. In particular however, try a waterfall walk such as Steall Falls at the head of Glen Nevis, Inchree Falls at Onich or the Grey Mare's Tail in Kinlochleven. If particularly wet and windy, then forests are often a good choice due to the shelter available - Glencoe Lochan Walks, Glenachulish and Inchree are all nearby. Choose between rock or ice. You'll find both indoors at the Ice Factor in Kinlochleven. It doesn't matter if you're a complete novice as instruction can be provided. Many families report this as great entertainment and there's a free soft play area for the very young to enjoy. 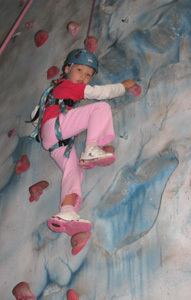 See our climbing web page for some additional information and photos. In addition to the rock and ice walls, there's also an aerial activity course which is full of thrills! You can learn about some of Glencoe's long history at the Glencoe Folk Museum located in the centre of the village. You can't miss it. Its the old building with the thatched roof. Learn about the Massacre of Glencoe, the Ballachulish slate quarry and our burial islands. The museum also holds events throughout the year check out their website to find out more. The National Trust for Scotlands' award-winning eco-friendly Visitor Centre located just outside the village of Glencoe has frequent guided walks and 4x4 safaris throughout the summer including childrens events. There is also a gift shop and cafe located at the vistor centre. Inevitably, when wet the town provides the draw. There's quite a few things to choose from besides the usual coffee in Nevisport.